The printed circuit board was made in KiCad version 2013-07-07 BZR 4022 Stable (open source). Some components were custom made and some from specific libraries including the 3D models. The next image shows the schematic. On the next images is shown the Printed Circuit Board layout and its 3D model ready to print and start the fabrication. KiCad is a very flexible software allowing to import and use logos and 3D models of the components as we tested on this design. The Kicad work was done and the next step was Printed Circuit Board fabrication. At eLab Hackerspace we achived the best results using the toner method and etching with muriatic acid and hydrogen peroxide. After completed PCB the next step was driling the holes for the components and its solder in place. 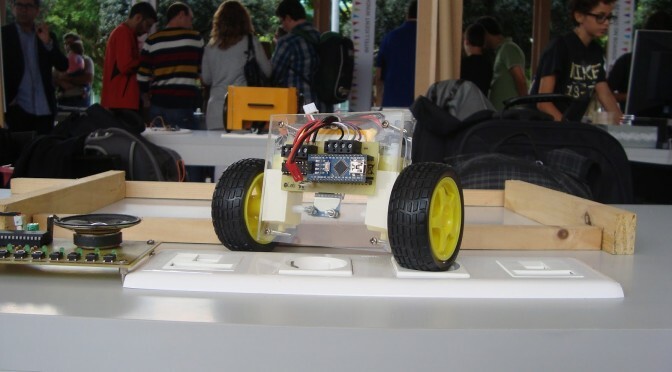 The SBR was ready to the Lisbon Maker Faire and the visitors feedback was positive. The robot standed on two wheels using the gyroscope’s inclination readings to position the mass center of the robot on the vertical. Thats one heck of a Bill of Material list. I think many robotics/engineering aficionados would love the opportunity to work with the same list. Looks like a great outcome. Thanks for sharing! Hey what was your motor’s RPM ? The DC Motor has 125 RPM. The gear box attached provides a reduction ratio of 48:1. When we use your Arduino code, we have two .ino, one for i2c and one for the balancing robot, but do we need to include the i2c in the balancing robot code or i don’t know how to compile it? Second question, if my gyro is not between the two wheels, but higher of 3cm can i ajuste the code to fit with my conception? Nice project.I would also like to make this one so can you share me code and circuit diagram plz.